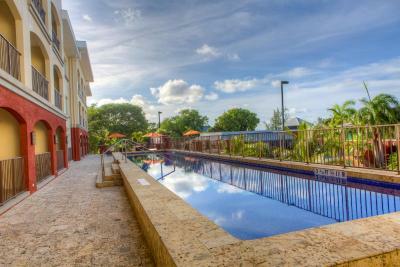 Lock in a great price for Courtyard by Marriott Bridgetown, Barbados – rated 8 by recent guests! Food was good.....front desk staff very friendly and helpful. Location close to the boardwalk and other areas of interest in Barbados. Safe. Scenic. Really nice service, including the ladies who serviced the room. The facility is pleasant but extremely expensive. I want to know why you charged me $200 more for my final night’s stay than the previous nights. I want a refund. Clean, friendly staff, located within close proximity to town and night life. Location was perfect. Very modern and clean. The staff were very pleasant and helpful. Spacious smart room. Location excellent for touring around. The staff in all areas of the hotel were excellent. Breakfast A la carte and buffett were very good. 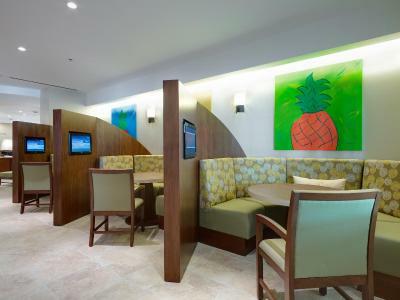 Had dinner there once, it was OK.
Courtyard by Marriott Bridgetown, Barbados This rating is a reflection of how the property compares to the industry standard when it comes to price, facilities and services available. It's based on a self-evaluation by the property. Use this rating to help choose your stay! A 5-minute walk from the beach, Courtyard Bridgetown is in the historic Garrison area and 2 miles from Graeme Hall Nature Sanctuary. It features an on-site restaurant, an outdoor pool, and free Wi-Fi. The bright and contemporary guest rooms at Courtyard Bridgetown include a flat-screen TV and a refrigerator. They are also furnished with a work desk. 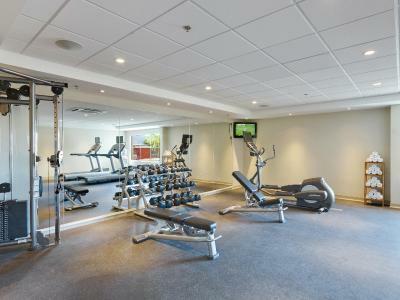 The on-site pool and gym features full-length mirrors, a mounted TV, and a variety of cardio equipment. After a workout, guests can relax in the hot tub. 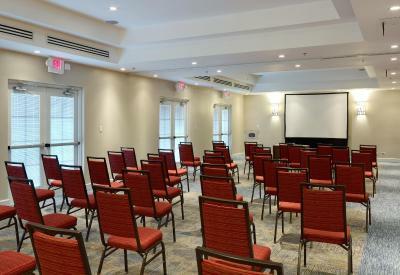 Guests at the Courtyard by Marriott have beach access that includes lounge chairs and towels at Coconut Beach, just a short walk across the street from the hotel. International cuisine is served at Centro, the Bridgetown Courtyard’s restaurant. It is open for breakfast, lunch, and dinner. Atlantis Submarine Tours is a 10-minute drive from this Barbados Courtyard. Grantley Adams International Airport is less than 9 miles from the hotel. 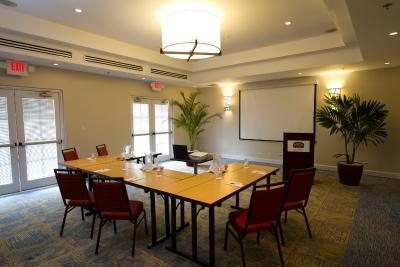 When would you like to stay at Courtyard by Marriott Bridgetown, Barbados? New Barbados Hotel guest room with one king bed featuring Marriott's Revive Bedding, LCD TV, work desk, hairdryer, coffee maker, iron, and contemporary styling with rich hues. 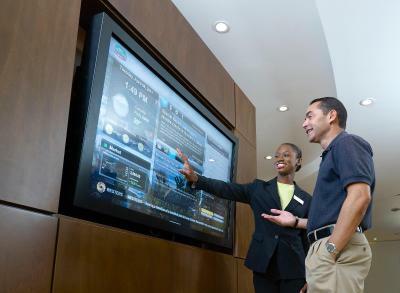 The room also features free Wi-Fi internet access and air conditioning. New Barbados Hotel guest room with two queen beds featuring Marriott's Revive Bedding, LCD TV, work desk, hairdryer, coffee-maker, iron; all-in contemporary styling with rich hues. The room also features air conditioning and free Wi-Fi internet access. This room features air conditioning, a sitting area, flat-screen cable TV, a fridge and a bathroom with a bathtub or shower and a hairdryer. This room features air conditioning, a separate bedroom, a sitting area, flat-screen cable TV, fridge and a bathroom with a bathtub or shower and hairdryer. Stay at a modern and comfortable Barbados hotel, the Courtyard Bridgetown, Barbados. Whether traveling for business or pleasure, the Courtyard offers convenient access to Bridgetown and Christ Church, local attractions, restaurants and night life. 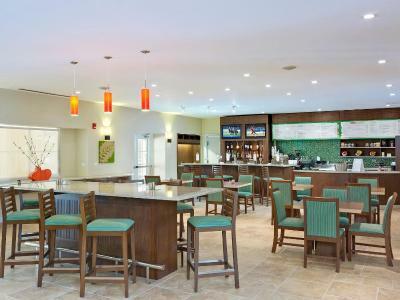 House Rules Courtyard by Marriott Bridgetown, Barbados takes special requests – add in the next step! Free! Up to two additional children or adults stay free of charge when using existing beds. One child under 2 years is charged USD 20 per night in a crib. 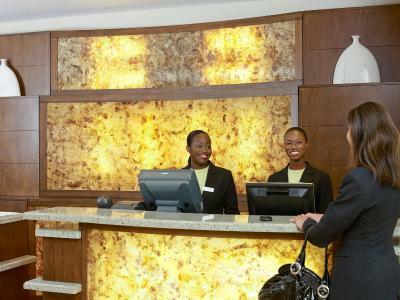 Courtyard by Marriott Bridgetown, Barbados accepts these cards and reserves the right to temporarily hold an amount prior to arrival. At this time the shuttle will run on Fridays, Saturdays and Sundays. The shuttle will depart the hotel on these days at 10:00am to transport guests to Copacabana Beach Club, a 6- 10 minute (1.4 mi) drive away . Pick up from Copacabana Beach Club for return to the hotel will be at 3:00pm on the highlighted days. There is an entrance fee of US$10 per person for access to Copacabana Beach Club which features, sun loungers, umbrellas, shower facilities, changing rooms, complimentary Wi-Fi and access to the Bar and Restaurant. Please note however that the US$10 is fully redeemable at the bar and restaurant. Watersports are also available at a fee and beach towels are available in all hotel guest rooms. The breakfast starts at 7:00 am, but many, as myself, have to leave at that hour to get to the early flights. If the BF began at leas 30 minutes earlier it would be great. Wasn’t crazy about the breakfast. It was OK, not great. Room size, room appointments and cleanliness. PRICE! $250 a night. OUCH. My group and I came in later than expected due to a delayed flight. The hotel was not accommodating with a taxi service or an arranged airport shuttle, even though we called to inform them of the delay. When we got to the hotel, they assigned us 1 King bedroom and a room with 2 Queen beds, even though I booked 2 King rooms. After inquiring about it, the male receptionist was extremely rude and explained that those were the closest rooms to each other, which I never specified in my booking process. The receptionist never asked us if we were Marriott reward members, even though I booked through a third party booking agency. I also had issues with my credit card and the hotel’s machine...I asked the receptionist to do an offline transaction and he was clearly unaware of what the offline process was or probably didn’t even know how to use the visa machine, because he insisted on swiping my card three and four times. After getting up to the double queen room, the in-room refrigerator and the vent in the bathroom weren’t working (I’m not sure if the vent problem is an overall Caribbean hotel issue or if it was just this hotel. Meanwhile I tried to phone the receptionist, who never answered our call to the front desk. I gave them the benefit of the doubt because it was pretty late, but when confronted about the situation the next day, they said nothing could be done because it was working when the room was cleaned the day before... Sure?! So i never bothered. The breakfast wasn’t great at the hotel and the variety was minimal. The location of the hotel was perfect! Close to the city, restaurants, bars and pubs, there was a salon at the location as well. There was always sufficient parking, the WiFi was great, the pool was easily accessible and there were always fresh towels in the room. The daytime staff at the hotel were extremely helpful with booking tours and reservations for lunch/dinner. The restaurant staff our first night were not efficient. Took about 25 min after ordering food to finally get our food. We were not the only ones waiting. Good breakfast fruit could be more. Upon check in I was told that I had a 2pm checkout but on the day of checkout I was rushed out my room and the young lady at the front desk gave my partner an attitude which I did NOT appreciate. I had a meeting that was wrapping up at 1:30 which I explained. All I wanted was a chance to quickly shower and head out to pass the time until my flight. When she called the room she rudely addressed my partner saying we need to check out even though he as well tried to explain that the gentleman said our check out time was at 2pm. There is a way to speak to your guests, I would know because I work at Hyatt. She was dealing with another guest while we got downstairs so I was not able mouth train her. Please address this thank you! I however would still come back another time to stay because minus that incident every other staff members were AWESOME! Room service would be wondeful. Put we still had a great time.